Now that the Blu-ray/HD-DVD conflict over competing high-definition disc formats is settled, it’s time to take a detailed look at the admittedly confusing assortment of high-quality audio soundtrack options that Blu-ray discs and players will output, as well as which combination of cables, components and connections you’ll need in order to benefit from the available high-quality audio options. In the old days, it was pretty simple: first Stereo, then Dolby Surround, followed by Dolby Pro Logic, then Dolby Digital 5.1, with DTS tagging along as an optional but oft-included soundtrack on many DVDs. As soundtrack performance progressed, our budget and inclination to upgrade expanded as well, so we could take advantage of the improved audio standards. One of this hobby’s many delights is the ongoing enhancement of our audio-video sources, with its ever-present process of upgrading, even when some of the ballyhooed advances may not be as dramatic as some of the manufacturers and marketers would have us believe. Still, engineering never stands still, so to heck with the expense and onward and upward with greater audio and video fidelity! The standard DVDs you own now all use “lossy” multi-channel soundtracks, developed by Dolby Labs and Digital Theater Systems (DTS). “Lossy” means that a lot of data are thrown away using perceptual coding in order to greatly reduce the amount of “digital” space occupied on the disc by the soundtracks. The perceptual coding is very sophisticated (it’s based on the principle that sounds softer than you can detect in the presence of louder sounds at or near the same frequency do not need to be encoded). This process enables Dolby Digital and DTS to carry six-channel discrete soundtracks (five channels plus a “.1” low-frequency effects channel), which run at relatively low data rates even when compared to the data rate from a lossless two-channel format like Compact Disc’s “Red Book” PCM (pulse-code modulation). While lossy formats like Dolby Digital 5.1 and dts can--and do--sound really excellent, far better than the old analog soundtracks of the past, anyone would agree that lossless soundtracks such as those offered on Blu-ray are preferable if enough space is available on the disc. Just to emphasize, a PCM audio track like that from a compact disc is lossless: it’s a stream of “1s” and “0s” that precisely describe the frequencies and relative loudness (amplitude) of a music signal. No data are discarded to conserve bandwidth. And Blu-ray’s new lossless soundtracks use sampling rates and word lengths greater than compact disc and have the considerable potential to sound superior to the existing lossy Dolby Digital/dts formats. The three lossless audio formats associated with Blu-ray players’ high-resolution audio soundtracks are Dolby TrueHD, DTS-HD Master Audio (MA) and Linear PCM (Linear Pulse-Code Modulation). These formats will all convey eight discrete channels (7.1) of no-loss audio that exactly duplicate the original studio masters, but there are various ways of extracting the signals depending on how new or current your AV receiver is and what kind of input connections are available. Owners of AV receivers that have a set of multi-channel analog input jacks—usually six or eight RCA female inputs—need not despair. As long as you get a Blu-ray player which has internal decoding of the aforementioned formats and that’s equipped with a full set of analog output jacks, then you can still connect and benefit from the impressive high-resolution audio included on most Blu-ray discs. Your AV receiver doesn’t need HDMI inputs or outputs as you can still route the 1080p video directly over HDMI cables to your TV display or projector, bypassing your AV receiver for Blu-ray video. You will require a set of six or eight analog RCA cables to link the Blu-ray player’s analog RCA audio output jacks to your AV receiver’s multi-channel analog input set. If you don’t care or don’t want to be bothered connecting the analog eight-cable set, then you could still use an optical digital or coaxial digital output from the Blu-ray player to the AV receiver’s optical or coaxial input. Your AV receiver will extract a standard lossy Dolby Digital 5.1 mix from the Blu-ray disc’s Dolby Digital Plus soundtrack. The latter is a lossy audio format, so you can expect the audio to sound as good as any standard DVD’s Dolby Digital mix or maybe better, because Dolby Digital Plus runs at a higher data rate that your AV receiver’s chip set may benefit from. Dolby TrueHD is based on the original Meridian Lossless Packing profile that was developed for DVD-Audio, in which eight channels are compressed to take up less space but then exactly reconstructed by the player so there are no losses. If you get a Blu-ray player that will “unpack” or decode Dolby TrueHD and output it via HDMI in PCM form, then you all you need is an AV receiver that’s capable of receiving multi-channel PCM via HDMI. 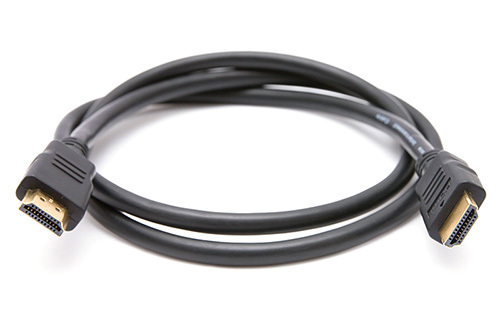 Any version of HDMI cable will carry multi-channel PCM--- including HDMI 1.0 through HDMI 1.3. However, your AV receiver must be able to deal with eight channels of PCM audio via HDMI connection. The other method of extracting and hearing Dolby TrueHD is by what’s known as bitstreaming: a raw data stream of Dolby TrueHD that is sent from the Blu-ray player via HDMI 1.3 to an AV receiver that has built-in decoding of Dolby TrueHD. So far, there are only a few AV receivers with this capability, however more and more will be appearing with each passing month. Similar to Dolby TrueHD, the same requirements exist for extracting the DTS-HD lossless Master Audio tracks, which like Dolby TrueHD, can carry up to eight discrete audio channels. You must have a Blu-ray player that will internally decode DTS-HD MA or output it via a bitstream and HDMI 1.3 to a new AV receiver that has a built-in decoder for DTS Master Audio. How Much Better Will Dolby TrueHD and DTS-HD MA Sound? I can’t say with certainty how much better the advanced lossless soundtracks will sound compared to existing Dolby Digital or dts 5.1. What I can say is that they will sound at least as good as DVD-Audio and SACD multi-channel recordings or your best-engineered CDs, if we’re talking two channels. The best of DVD-A and SACD recordings are spectacular, as good as audio sources are likely to get in the next decade or so, and the same lossless traits characterize the new high-rez audio soundtracks from Blu-ray. As careful listening comparisons have shown, the multi-channel aspect of music and soundtrack reproduction increases realism by a substantial margin over 2-channel stereo. The potential to reproduce studio master tape quality for all the channels of a movie or concert in your home is an enormous luxury that could barely be envisioned in decades past. Even now, I recall the first demonstration of a digital stereo recording at a meeting of the Toronto Audio Engineering Society more than 25 years ago, and what a huge audio liberation it seemed to me at the time. I say “liberation” because it seemed immediately evident to my ears that the digital music recording of a piano and singer freed stereo reproduction from the constraints of background noise, flutter, audible distortion and the severely compressed dynamics that, to a greater or lesser degree, characterized all analog recordings up until then. Now it’s up to the loudspeaker, subwoofer and amplifier manufacturers to design equipment that will accurately reproduce everything present on the Dolby TrueHD, DTS Master Audio and PCM soundtracks—and it would be immodest of me to point out where Axiom lies on that continuum! – A.L.